Thursday, 14 October 2004 at 7:30 P.M.
Our Next Meeting is scheduled for Thursday, 14 October 2004, as a Joint Meeting of the Baltimore and DC SIGAda Chapters. Terry Bollinger will be speaking on "Security of Open Source Software in Distributed Systems". Munchies and soft drinks will be served at 7:00 PM, the general meeting will start at 7:30 PM, followed by the program. Is the growing use of open source software in both commercial and DoD systems a security disaster in the making, or a wake-up call that it is time to change how we think about security in a networked world? Join us as Terry Bollinger discusses the pros and cons of open source software. Terry’s topics will include basic concepts of trust and risk in distributed systems and software, how internationalization of software development affects security, near-term dangers from automated attack and analysis, and the necessity of viewing distributed security as "continual warfare". Terry Bollinger is an IT Analyst at the MITRE Corporation. He is the lead guest editor for the upcoming IEEE Software November/December 2004 issue of on how to make classic software engineering properties such as security, scalability, and maintainability more resilient in the face of rapid software change and global networking. Before that he was an editor of IEEE Software for six years, and guest edited an earlier issue of IEEE Software on Linux. Terry also authored an influential 2003 MITRE report that documented widespread use of open source software in the U.S. Department of Defense, wrote the Wiley Encyclopedia of Software Engineering article on Linux and open source, and was a co-recipient of the Potomac Forum Leadership Award for his work on open source issues. His other interests include physics, chemistry, and nanotechnology. MITRE2 is on Colshire Drive just inside the beltway south of Route 123. Colshire Road is known as "Scotts Xing" on the North side of Route 123. Colshire Road is located on Route 123, East of I-495 and West of the Dulles Access Highway. Going Northbound on 123 from I-495, Colshire Road is located 2 stoplights on the right. Going Southbound on 123 from the Dulles Access Highway, Colshire Road is located at the first stoplight on the left. Once on Colshire Road, MITRE2 is the building immediately in front of you. A tiny traffic circle is designed to take you to the front of MITRE2 and to MITRE1 (the Hayes Building). The directions below route you to the parking garage behind the MITRE2 Building. This is a logical left-hand turn at the traffic circle. After the turn, MITRE2 will be on your right. At the DC SIGAda meeting on 13 May 2004, Dr. Alfred Kromholz of MITRE gave an excellent presentation titled: Mapping Software Assurance to the Software Engineering Process. Slides from his presentation are available online as a PPS Presentation at http://www.acm.org/sigada/locals/dc/20040513_Alfred_Kromholz.pps (ppt, 331KB). 9 November 2004 - The next meeting of the ACM Baltimore SIGAda Chapter Meeting for Tuesday - TBD will be speaking on TBD. 13 January 2005 - The next meeting of the ACM DC SIGAda Chapter Meeting for Thursday - Ross Rader of Lockheed Martin will be speaking on FAA Enroute Automation Modernization Program . 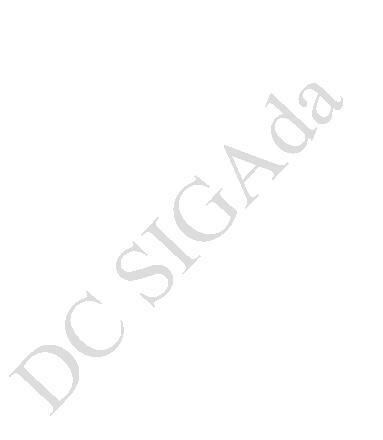 Please visit the DC SIGAda Web site at http://www.acm.org/sigada/locals/dc/ for additional information. Please provide suggestions on the Web site and its contents. We are particularly interested in ways the DC SIGAda Home Page can serve you better. Please forward this message to people who might be interested in attending. We welcome all new members as our attendance and interests grow. Many thanks to all earlier participants, contributors, speakers, advisors, and friends, who are involved in helping to produce and attend the meetings.